There are over 3,000 different species of mosquitoes throughout the world. Currently 176 species are recognized in the United States, roughly 50 species of mosquitoes in our region, and at least 28 species bite humans. Typical mosquitoes in our region are about 3/8- to 1/2-inch long with slender legs, and scaly wings that fold over its narrow body. The mosquito has a tube-like mouth called a proboscis. Female mosquitoes’ mouthparts form a long piercing/sucking proboscis. Males differ from females by having feathery antennae and mouthparts not suitable for piercing skin. A mosquito’s principal food is nectar or similar sugar source. Most mosquitoes lay their eggs on the surface of fresh or stagnant water. The water may be in tin cans, barrels, ornamental ponds, swimming pools, puddles, creeks, ditches, or marshy areas. Mosquitoes prefer water sheltered from the wind by grass and weeds. Mosquito larvae emerge from the eggs within 24 – 48 hours almost in unison. Mosquito larvae, commonly called “wigglers,” live in water from 4 to 14 days depending on water temperature. Larvae of almost all species must come to the surface at frequent intervals to obtain oxygen through a breathing tube called a siphon. Larvae are constantly feeding. They hang with their heads down and the brushes by their mouths filter algae, plankton, fungi, other microorganisms to nourish the growing larvae. During growth, the larva molts four times. The stages between molts are called instars. At the 4th instar, the larva reaches a length of almost 1/2 inch. When the 4th instar larva molts, it becomes a pupa. Mosquito pupae, commonly called “tumblers,” live in water from 1 to 4 days, depending upon species and temperature. The pupa is lighter than water and therefore floats at the surface. It takes oxygen through two breathing tubes called “trumpets.” The pupa does not eat, but it is not an inactive stage. When disturbed, it dives in a jerking, tumbling motion toward protection and then floats back to the surface. 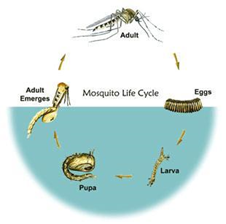 The metamorphosis of the mosquito into an adult is completed within the pupal case. The adult mosquito splits the pupal case and emerges to the surface of the water where it rests until its body dries and hardens. Only female mosquitoes require a blood meal and bite animals or birds. Stimuli that influence biting (blood feeding) include a combination of carbon dioxide, temperature, moisture, smell, color, and movement. Male mosquitoes do not bite. Acquiring protein (a blood meal) is essential for egg production, but both male and female mosquitoes are nectar feeders for their main source of nutrition. Human blood meals are seldom first, or even second choices of female mosquitoes. Horses, cattle, smaller mammals, and/or birds are preferred. Mosquitoes cause more human suffering than any other organism. Over one million people worldwide die from mosquito-borne diseases every year. Not only can mosquitoes carry diseases that afflict humans, they also transmit several diseases and parasites that dogs and horses are very susceptible to (Heartworm, West Nile virus, and Eastern Equine Encephalitis). In addition, mosquito bites can cause severe skin irritation through an allergic reaction to the mosquito’s saliva – this is what causes the red bump and itching. L.C.S. Lawn and Tree Service, Inc. mosquito applications last up to 4-6 weeks and kills mosquitoes on contact. A treated property will not yield 100% reduction but will give a significant break from the pest.